Our next den meeting is a visit to a local Boy Scout troop in which we will participate in an actual troop-meeting at the Lutheran Church of God's Love with the scouts of Troop 29. 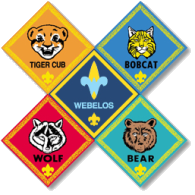 This will be an opportunity for our boys to observe the troop meeting, get to know the people of the troop and consider it for a new home after the boys earn their Arrow of Light award and crossover to Boy Scouts. Homework: Review and practice the Scout Oath and Scout Law; the boys will do this with the troop as part of their opening ceremony.